new look for the new year! are you as excited as we are about 2013? we think this is going to be our best year yet, and hope it will be an especially happy, healthy, and creative one for you! to honor the new year we've updated our header and we have a lovely new badge for you, though we're keeping a badge from each of our previous years on the sidebar so you can have a choice! we'll be back at midnight with our very first holiday cards of 2013 and we can't wait for you to join us! Sending you all the best from the Jingle Belles. 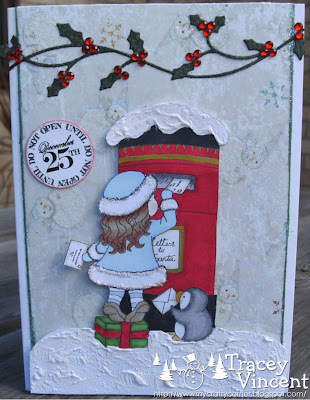 Check back on January 1st for the first Jingle Belles prompt of 2013 as we start ... taking back December one holiday card at a time. 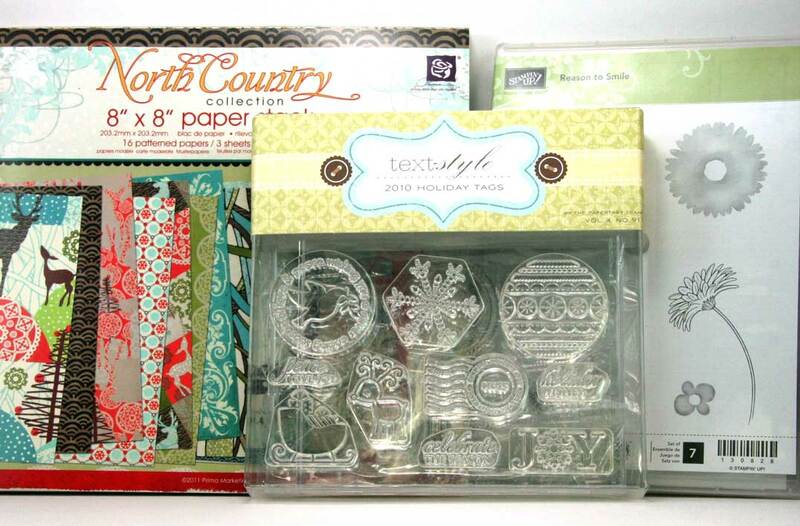 so we can send this fabulous prize to you ASAP! 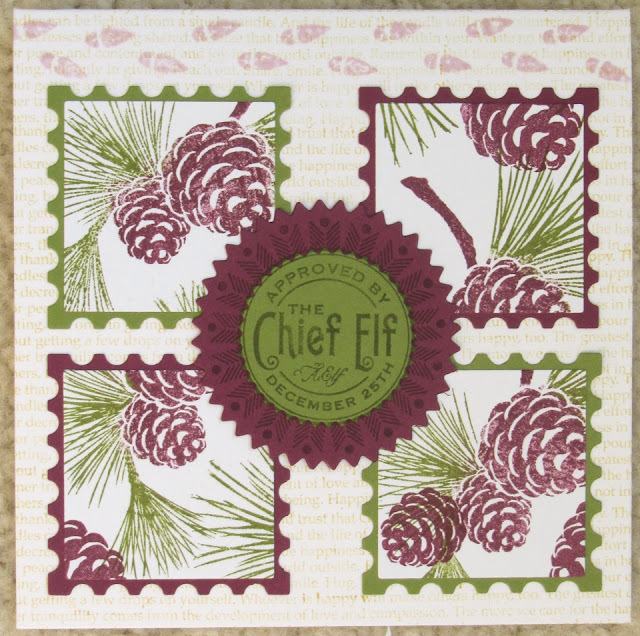 We know how hard you've worked on holiday cards all year, and if you made one card per week along with us, you've now got a stash of *48* unique and beautiful greetings ready to send to your family and friends! But maybe you still need a few more cards, or maybe-- like us!-- you're just really feeling "in the swing" now and want to play along with some of the other fun Christmas card challenges out there on the wonderful world-wide web?! (Check out our links list on the sidebar for a few ideas!) 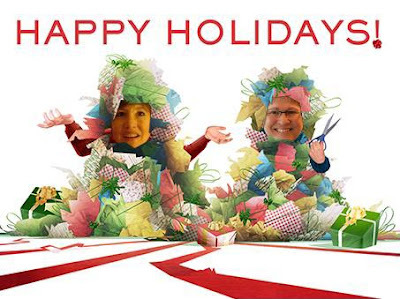 Whatever the case, if you're still making holiday cards, we still wanna see 'em, ♥JINGLE BELLES♥! So we've added a special "Anything (Holiday) Goes" link, below, for you to display your Christmas, New Year's, Hanukkah, Solstice, or even just generally "wintery" cards; alternately, you can use it to check out what your fellow Belles are making and find some clever ideas! We'll even do our best to get that in the mail to you in time to play along with our first official prompt of 2013, which will debut right after the clock strikes midnight on New Year's Day, and we hope ♥YOU♥ stop by and check it out! 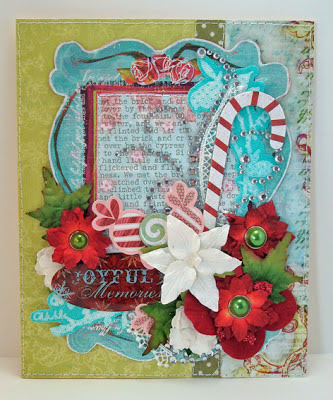 In the meantime, happy cardmaking, ♥JINGLE BELLES♥ and Happy Holidays! a ♥FEAST♥ for the eyes!!! 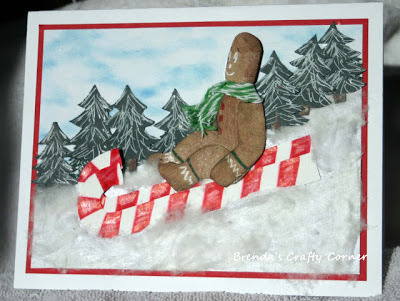 did much more than "slide by" with her fabulously fun and creative gingerbread man on his candy cane sled! 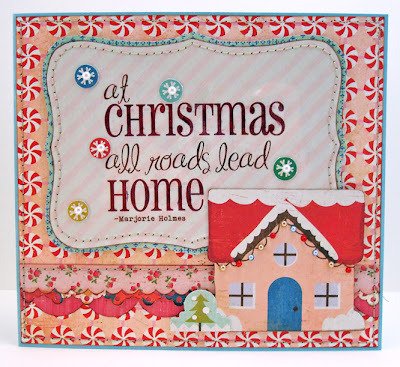 each image is hand cut and perfectly embellished, while details like the twine scarf and fluffy polyfil snow add even more texture and interest! 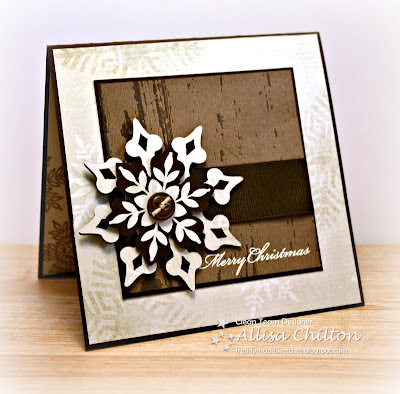 cleverly paper-pieced this simple and lovely christmas pudding stamp in a charming patchwork style, for an effect that's completely unique-- as is her card's wonderfully personal greeting! 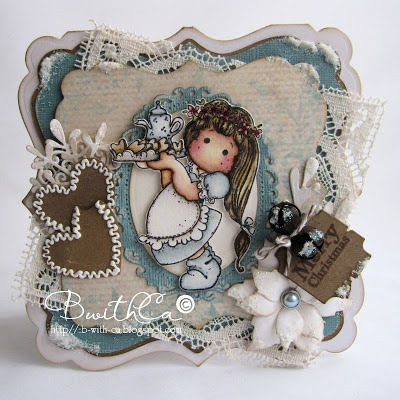 stamped and beautifully colored her adorable image, then cut, shaped, layered, trimmed, distressed, iced, inked, embellished, decorated a card in which one just keeps on finding the sweetest treasures! many thanks to everyone who participated in this prompt, and extra helpings to those of you who supported us throughout the entire year. it truly is our fellow ♥JINGLE BELLES♥ who make this so much fun! we've had a blast for the last eleven months, and heartily invite you to join us again on january first when we'll kick off our third year of holiday hijinks! oh bring us some figgy pudding! Stef says, "Gingerbread is a favorite holiday treat ... I have such fond memories of decorating the little boys & girls with my Grandma. The horizontal strips are Martha Stewart Border stickers ... sentiment and the *zig-zag stitching* are both SRM Stickers ... and the corrugated circle is also a food elements ... punched from a thermal coffee sleeve I saved for just such an occasion ... layout is the November Sketch For You To Try." Lauren says, "this year i was completely fascinated and inspired by the 12 days of christmas card ideas on the prima blog, and fell particularly in love with cari fennel's card from day 5. here is my take on that idea, but with a twist: candy canes and other sweet treats make up part of my floral bouquet, to prove that this prompt is pretty flexible: your festive food can be the centerpiece of your card, or merely an accent, it's entirely up to you!" 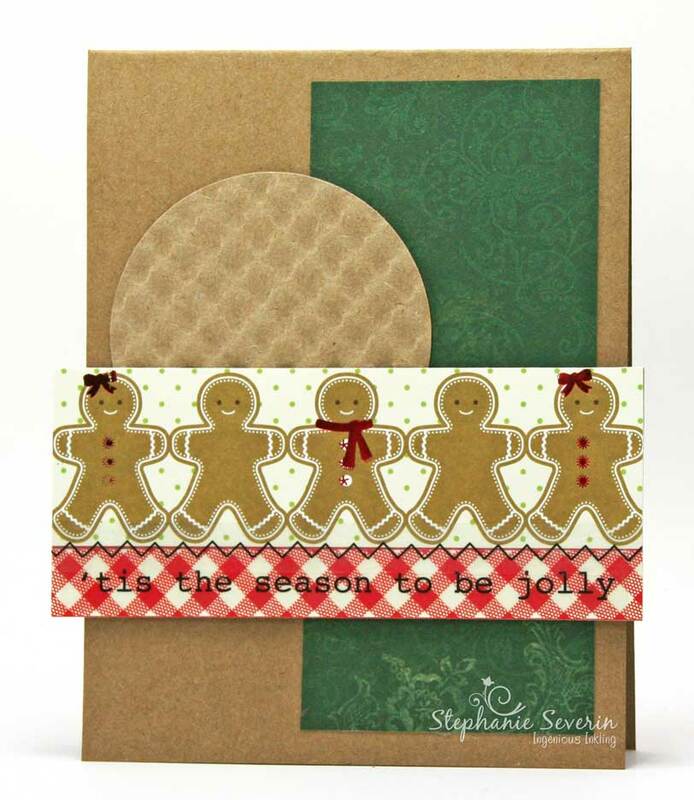 Remember ... cards made with food (unlike a big plate of stuffing and mashed potatoes) have no calories ... so create away. 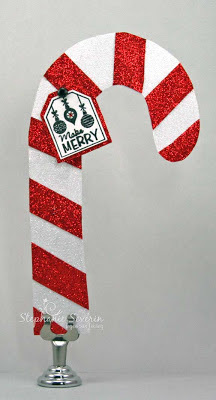 Stephanie says, "There are certain foods (yes, I most definitely consider candy a food) that always remind me of Christmas, and Candy Canes are most certainly one of those. My Grandma put a Candy Cane in our stocking every Christmas, so this card reminds me of how much I enjoyed celebrating the holidays with her. 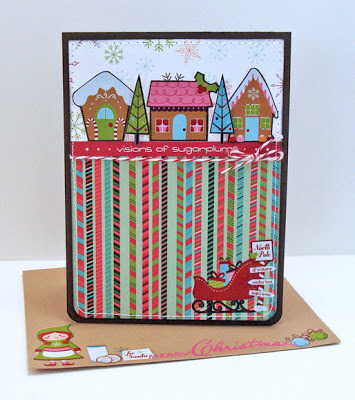 I cut out a candy cane card base (the card fold is along the left) and covered the entire shape with white glitter wrapping paper. I used extra-strong double-sided tape to adhere the red glitter wrapping paper stripes and finished with a sentiment tag backed with more red glitter paper & a tiny red gem for accent." 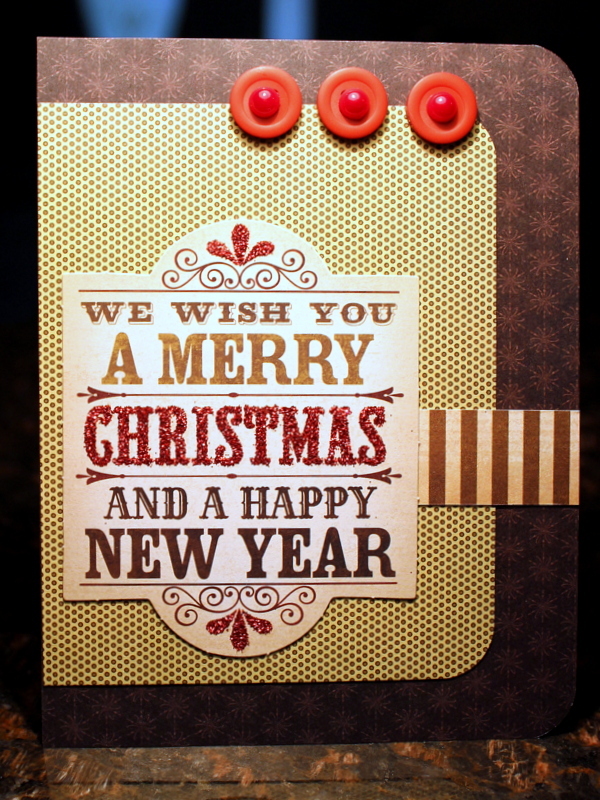 so bring us your figgy pudding... and any other festive foodstuffs you can fit on a card! be sure to link it up right here between now and 6pm (EST) on wednesday, november 28th. keyword for galleries and our flickr group is JB12-24. First, a HUGE thank you to the talented Allison Fillo for our wonderful Sketch this week. Next, here are a few of our favorite sketchy creations from this week. click through to see her cool transparency element. not to mention an adorable punny sentiment. and added some fun jingle bells too. Thanks to all of you for joining us for our sketchy fun ... check back at midnight for a delicious new prompt. We're back with more fun cards created using Lovely Guest Star Allison's fabulous Sketch ... hope you'll find time to get sketchy with us this week. Stephanie says, "This week I went more rustic using Halfway Cafe's Amarillo paper from Cosmo Cricket paired with Kraft and Distress Inked Ivory. 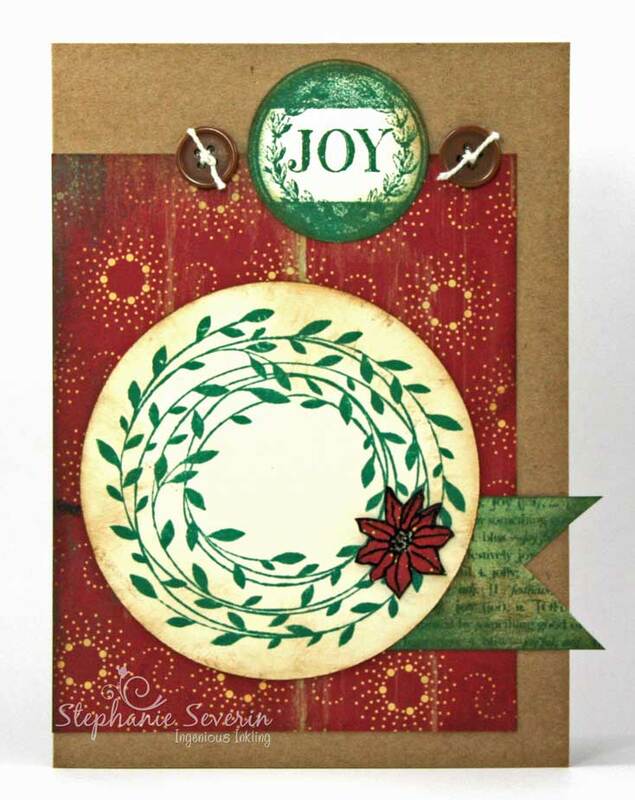 Stamps are from Hero Arts ... for me, that circle element in the sketch just cried out for a holiday wreath." Remember, you have until 6pm EST on Wednesday, November 14th to link-up. Do You Sketch What I Sketch? We are thrilled to have returning lovely guest star Allison Fillo with us at Jingle Belles this week ... and she also provided a fantastic sketch to inspire us. Allison manages a team of writers, trainers and curriculum developers by day and wild jackals by night (AKA as her children, Tristan, Charlotte and Avery). 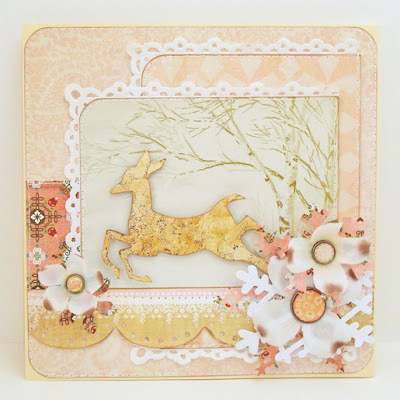 When she does get to venture into her craft room she enjoys cardmaking, scrapbooking and designing periodic sketch challenges for the Playing in Paradise Challenge. If you're looking for sketch ideas, the first place to stop each week is Allison's blog Stampin' When I Can, where she has a post that compiles links to the various sketch challenges around the blogosphere (that also shows a thumbnail of the sketches if you're looking for something specific). Allison says, "My card features rich color tones and fun button embellishments ... with a touch of glitter for some holiday sparkle." 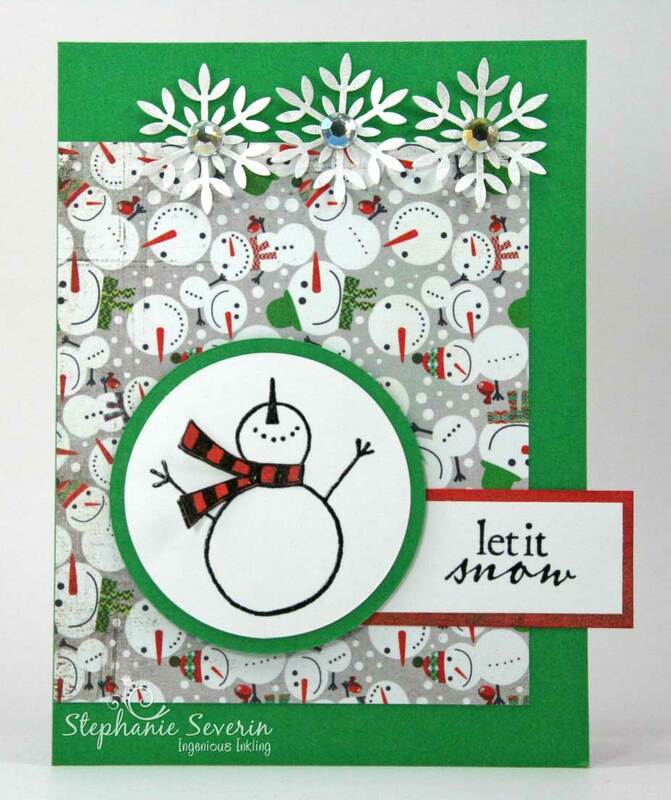 Stephanie says, "I decided I wanted to use some Basic Grey holiday papers this week, so the snowman background paper is where my design began ... 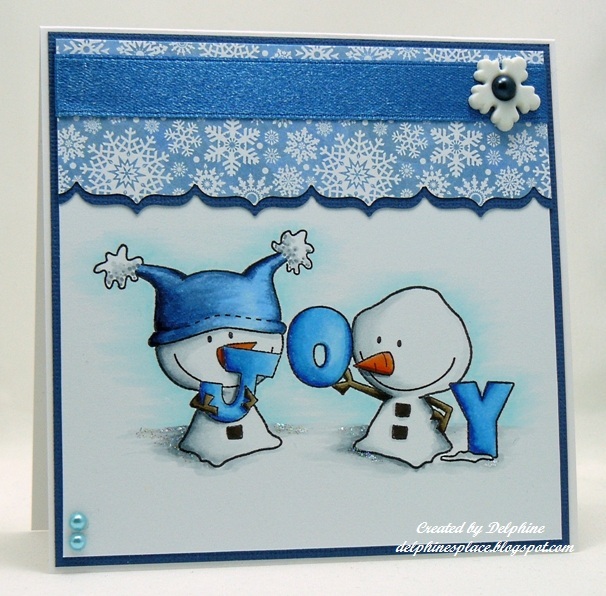 I thought this fun Savvy Stamps Snowman fit right in with that motley snowman crew ... I paper-pieced his scarf leaving the ends loose, so it looks like the scarf is blowing in the wind." Lauren says, "i've held on to this beautiful over-sized piece of german scrap for several years, waiting for just the right idea to come along, and when i saw allison's gorgeous sketch it was the very first thing i thought of! since it is so nice and big, i really didn't need much else to flesh out my 6x6" card... just some basic grey "jovial" papers, a little bit of vintage foreign text paper, and some musical themed tape to fill in all the shapes of the sketch, and i was all set!" Upload your sketchy cards by 6pm (EST) on Wednesday, November 14th using keyword JB12-23 for galleries & our Jingle Belles Flickr Group. We absolutely loved seeing all of the creative creature cards for this prompt ... so much fun. 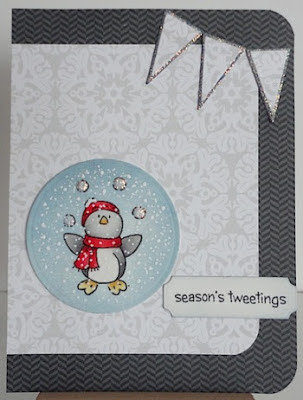 created a card featuring a whimsical owl decked out in holiday hues who is hanging-up his stocking ... so very cute. 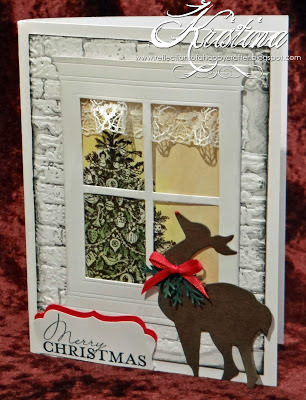 featured a holiday reindeer as her creature in her amazingly detailed window scene ... the inky bricks look so real and she even added a lacy curtain. rocked the polka dot monsta ... perfectly decked out for the holidays ... what a super-fun holiday card. Thanks to everyone who joined our fun Creature Feature ... check back at midnight for a super-special lovely guest star and another fun holiday card prompt. 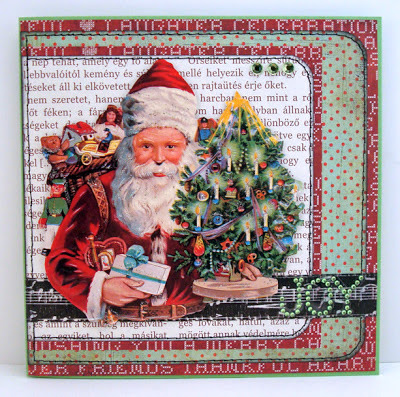 a very ♥MERRY MONDAY♥ to you, jingle belles! lauren here, just popping in to mention that i'm pretty excited to be a guest designer today at my favorite holiday card sketch, site merry monday! many thanks to lesley croghan and her very talented gang, who chose my monsta xmas card and invited me along; now i'd like to invite YOU along, as well, why not combine our creature feature prompt with their gorgeous sketch?! Stephanie says, "I'm a pretty chaotic crafter & sometimes my best inspiration comes from the piles of remains that are left on my craft table. As I was trying to figure out how I could incorporate the rest of these fun little dimensional penguin stickers ... 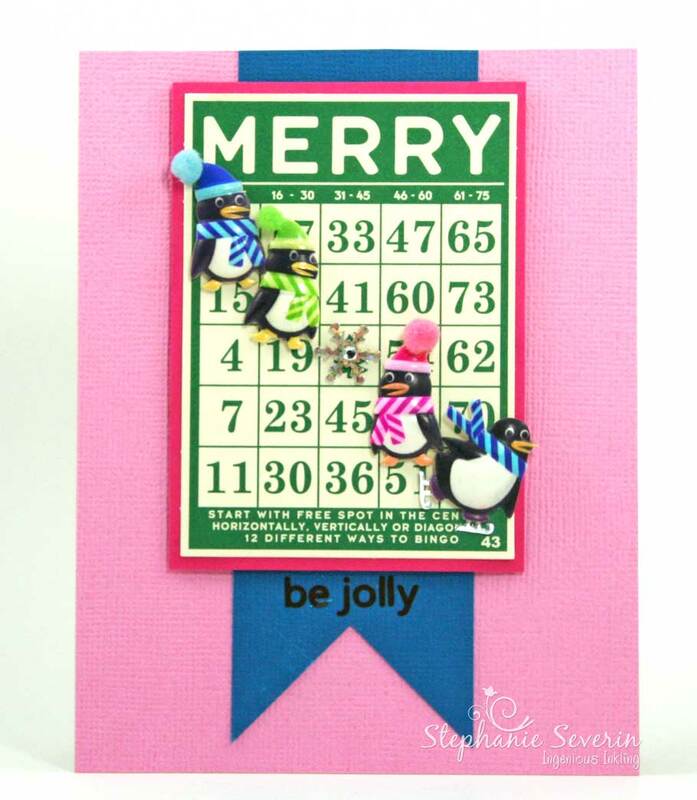 I saw the Holiday Bingo Card among the paper scraps ... and voila ... Jolly Penguin Bingo was born (using this week's iSpy Sketch) ... love these fun little guys." So keep those cards featuring all living creatures coming our way ... link them up by Wednesday, October 31st at 6pm (EST) using keyword JB12-22 for galleries & our Jingle Belles Flickr Group ... who knows, maybe we'll even throw in a little holiday surprise for one lucky participant. The next Jingle Belles prompt is a Creature Feature ... we're asking you to create a card with a living creature on it: reindeer, penguins, polar bears, moose, people, angels, elves... or, of course the most obvious Christmas Card presence ... Monstas. Lauren says, "ok, yeah, it's probably only *ME* who uses monstas in this context, and if you're looking for the explanation by which that phenomenon makes sense, i'm sorry but there really ISN'T one. 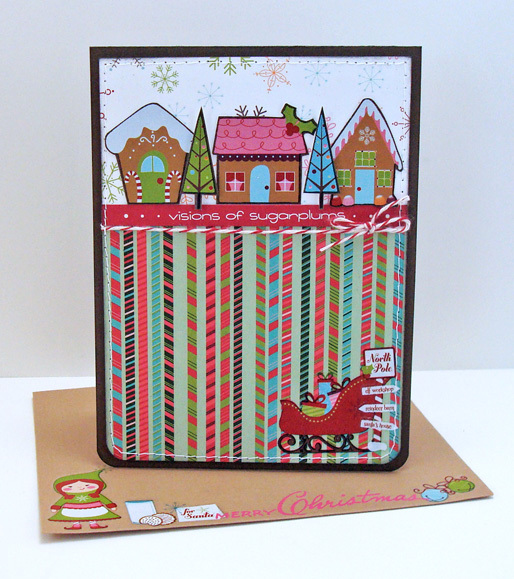 it's just that a few years ago i found this adorable paperchase giftwrap, and almost immediately, decided it would make great christmas cards! an admittedly weird decision which i stand by, because they still crack me up! :) but do feel free to take a more traditional route, there are LOTS of great creatures on THIS planet too, lol!" 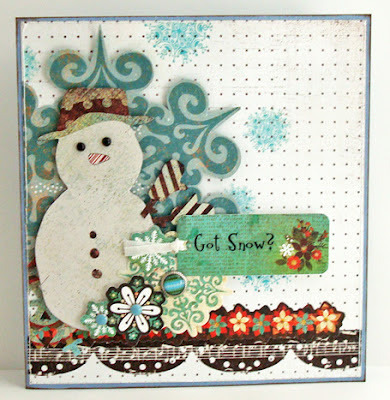 Stephanie says, "I used a several creatures including a tiny little holiday owl, a penguin and a reindeer (all from Hero Arts Merry Christams Ink 'N Stamp) on my Retro Sketch layout ... and I threw in a snowman for good measure. 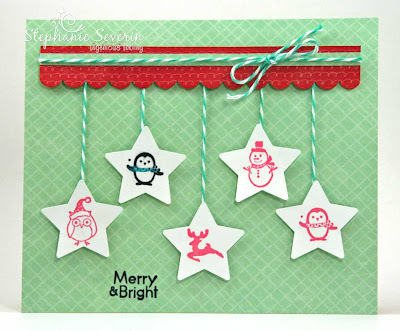 I stamped each image & then punched them out with a medium star punch, using some foam tape for dimension and pretty aqua twine." So break out your favorite holiday creature and see what fun cards you can create (or add a santa hat to your favorite non-holiday creature to get them in the holiday spirit). 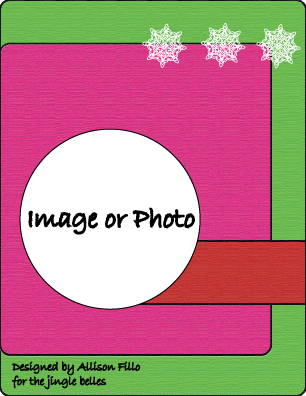 Upload your cards by 6pm (EST) on Wednesday, October 31st using keyword JB12-22 for galleries & our Jingle Belles Flickr Group ... who knows, maybe we'll even throw in a little holiday surprise for one lucky participant. proved that she not only knows how to blog, she also knows how to make really, REALLY awesome holiday cards, by submitting *TEN* UNIQUE AND BEAUTIFUL pink christmas cards!!! and yes, we are donating $4 for each and every one of them! do give yourself the treat of clicking through to see all ten, and while you're there, be sure to leave her some love! made two exceptionally lovely cards (the other is here) which prove that you can add a little accent of pink to even the most traditional color scheme and have it look amazing! not only incorporated the color, but also the message of our pink christmas prompt with her simple... and simply perfect... "season of hope" card! Lauren says, "this has been a craaaaaaaaazy week for me, so i really needed to make a FAST card, and there's nothing like using products from the same manufacturer for speeding things up, is there? 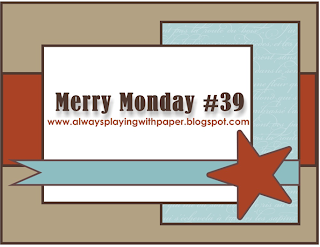 i've combined crate paper's peppermint collection with a few bits and bobs from other lines; made my own word art; and grabbed merry monday sketch #36 for my placement to finish in record time!" 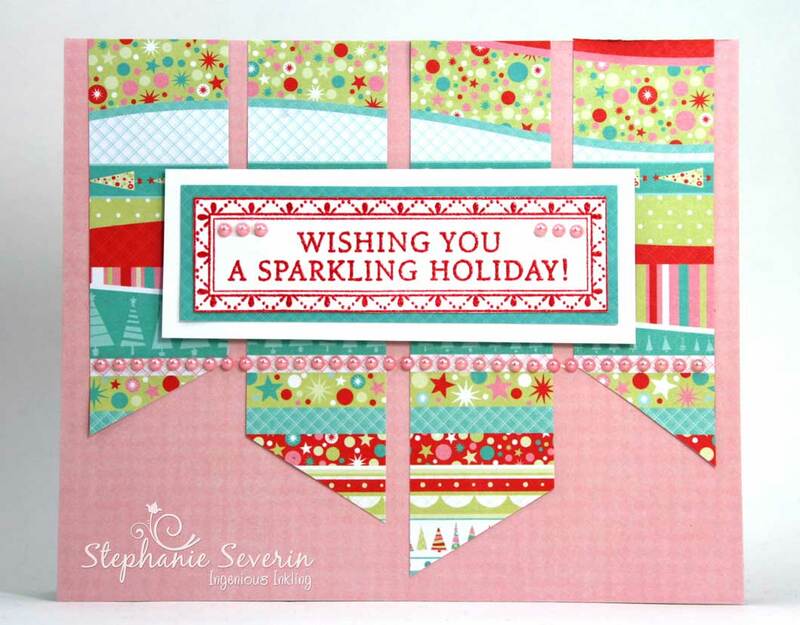 Stephanie says, "I combined one of this month's Hero Arts Sketches with fun papers from KaiserCraft's Christmas Carnival Collection ... love a holiday paper collection that includes lots of pink." And remember ... we'll be donating a total of $4 for every linked-up card to the Susan G. Komen Foundation ... so help us support a cure for breast cancer. if you played along with us last year at ♥JINGLE BELLES♥ you might remember that we dedicated the first card-making prompt of october to breast cancer awareness month, and that stephanie and i (lauren) honored all of the brave women who are coping with, or have battled, that disease in a couple of ways: first by making pink christmas cards, and then by donating a dollar each to the susan g. komen fund for every pink christmas card our fellow belles made and linked up with us during the challenge period, and we raised $75! this year our prompts are twice as long, so we've decided to go twice as big: we'll be donating $2 each, for a total of $4 per card. so for anyone who's been thinking about joining in with us, but hasn't yet, *THIS* is the week, you guys, let's RAISE SOME MONEY!!! 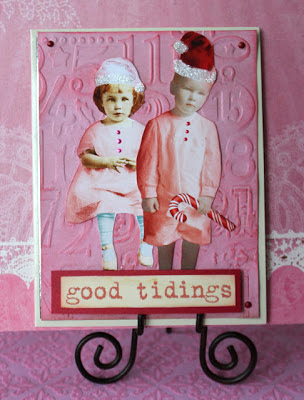 but first, let's make some ♥pink♥ christmas cards! the rules are simple: you can choose any shape, size, style, theme, sentiment, papers, embellishments and additional colors you want; you may combine with other challenges, use sketches from anywhere you like, and enter as many times as you wish, but you must make a NEW holiday card each time, and there has to be some pink on it somewhere! how much, and in what shade, we leave entirely up to you! 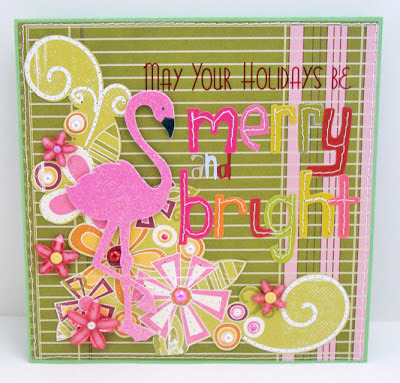 Stephanie says, "I decided to get pinky-inky for my card this week ... it started with a grunge board Christmas tree inked with Distress Stains, chalk ink and sprays of Glimmer Mist for all-over sparkle. I used what I call my Flourish Surgical Technique (explained in more detail on my blog) to decorate my tree. Finally, I used Distress Stain on a lacy doily for a pink background." Lauren says, "i think everyone knows by now that i LOVE pink! i love it in every shade, from salmon to fuscia, from blush to cerise; i love it for birthdays and baby showers, and i really, REALLY love it for christmas! i don't think i can be alone in this, either, because every year i see a few more holiday paper lines with pink in them. 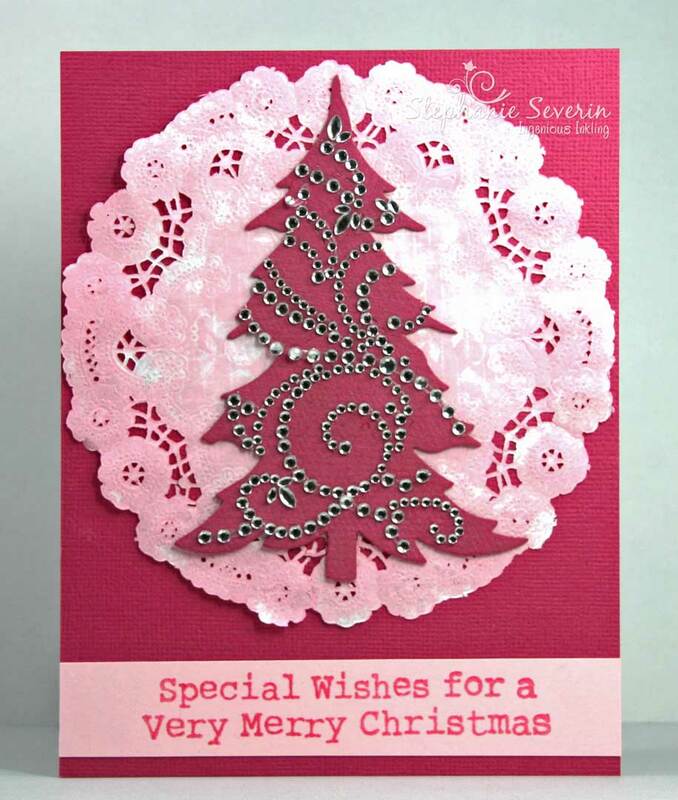 on the other hand, you don't NEED a lot of specialty products; in fact, apart from my snowflakes and sentiment, everything on my card is from my "everyday stash" and yet i think it's very festive... and there's no arguing that it's definitely very VERY pink!" of course the ♥PINK CHRISTMAS♥ cards we're really longing to see are YOURS, jingle belles, so break out your pink cardstock, papers, ink, rhinestones, snowflakes, and... well... anything else you like, and link up here by 6pm (EST) on wednesday, october 17th. keyword for galleries and our flickr group is JB:12:21.
used peaceful neutral tones to create a striking elegant snowflake design. that make us smile ... JOY for sure. Many thanks to everyone who played along, we always love to see what you do, and we're sure YOU will love to see what your fellow belles did this fortnight, so be sure to scroll down and check out the Fabulously Dashing Snow Gallery! We'll be back at midnight with a prompt we hope finds you in the pink... and we'll have a bit of a charitable "proposition" as well! Hope to see you then! We're still playing in the snow this week at Jingle Belles ... sledding, building snowmen, making snow ice cream ... just generally having a snowy good time. Well, most of us are, anyway! 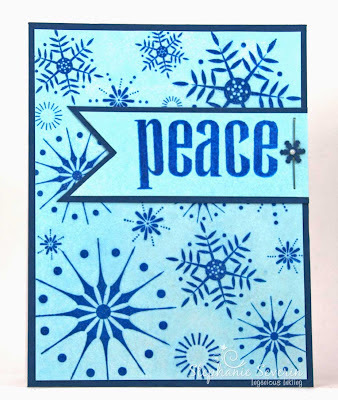 Stephanie says, "I used Hero Arts stamps with emboss resist and a combination of glimmer mists for my peaceful blue snowflake design ... layout is this week's Retro Sketch." 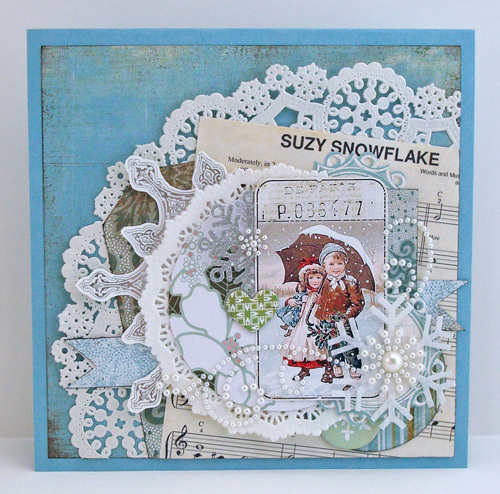 Lauren says, "i was almost 100% inspired by basic grey this week, all of the papers, most of the embellishments, and even the (layout) sketch i used all derived from various BG collections, so this card was super-quick and easy to pull together!" 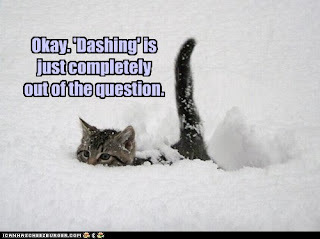 Remember, you have until 6pm EST on Wednesday, October 3rd to link-up your snowy creations; so no dashing is required! 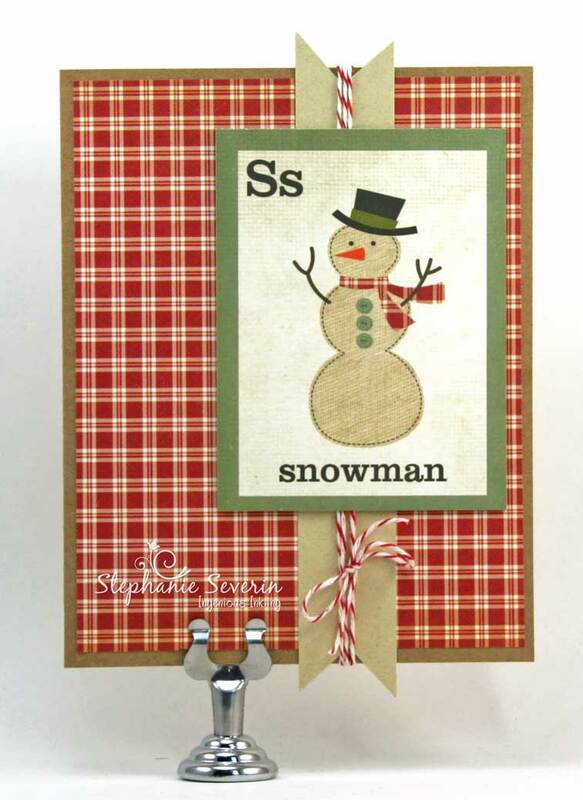 For our next prompt at Jingle Belles, we're Dashing Through the Snow ... creating projects that celebrate the white fluffy flakes of snow ... it might be snowmen, snowflakes, or just snowfall, but include some snow on your creations. Lauren says, "last year our lovely fellow belle marie bingaman suggested "suzy snowflake" (as sung by the awesome rosemary clooney) which had the distinction of not only being a fabulous inspiration for a prompt, but also being a holiday song from the 1950's which neither stef nor i-- serious xmas music aficionados-- had ever heard before! when i started sorting through supplies to make this "snowy" card, the leftover bit of sheet music was one of my first finds, and inspired (along with the current scrapbooking sketch from the basic grey blog!) my entire design!" Stephanie says, "I went with a homey little snowman from Simple Stories Handmade Holidays collection ... I love how the background designer paper coordinates with his scarf ... a bit of kraft & twine, and this card came together quickly using this week's Saturday Card Sketch at Two Peas in a Bucket." So think snow ... and share your creations with us. You have until 6pm (EST) on Wednesday, October 3rd to link-up your snowy cards; use keyword JB-12-20 in galleries and our flickr group ... and most of all, have some creative fun. 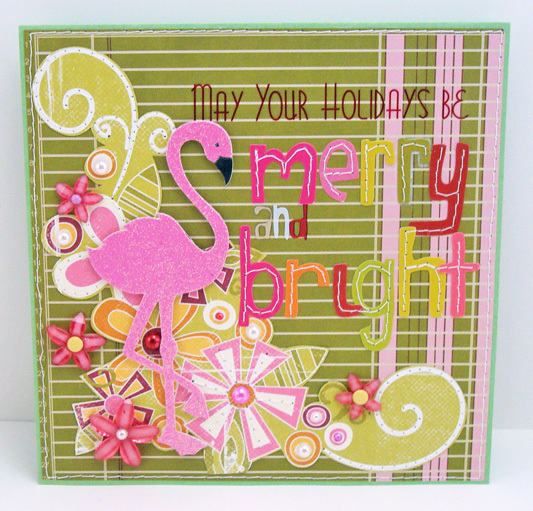 stamped and colored and cut out a card's worth of adorable elements to "make a scene" in the BEST possible way! created her gorgeous faux postage from scratch by cleverly using pinecone stamps and nestie frames for a design that *ALL* the elves are sure to approve! please send your snail mail to us at jinglebellesrock @ hotmail [dot] com so we can get that right out to you ASAP! 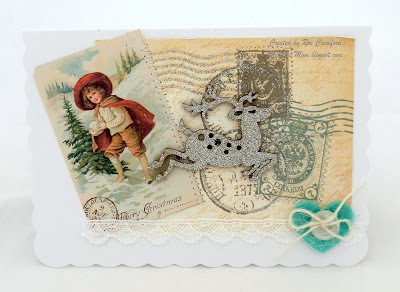 Stephanie says, "For this week's design I created my own "vintage" postcard using three different stamp sets by Artistic Outpost & Distress inks ... 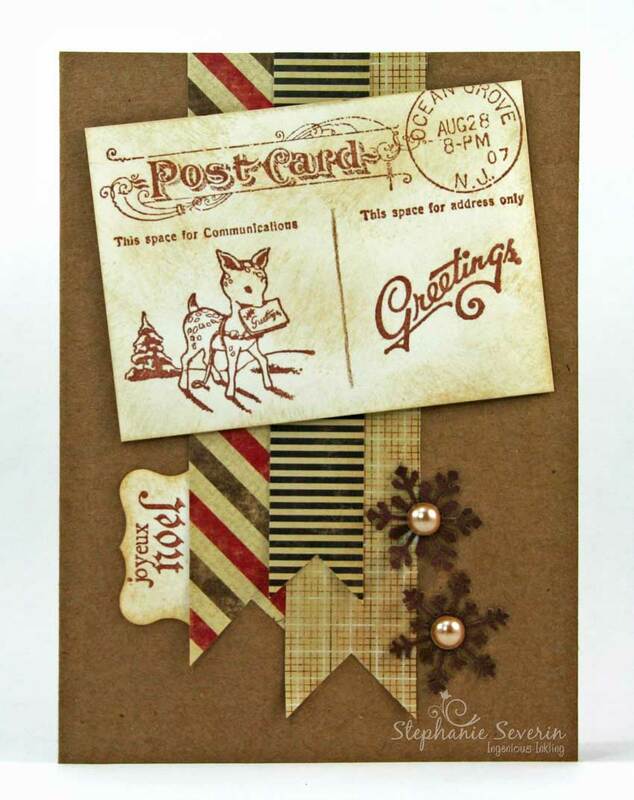 I love how the sweet little reindeer is delivering a letter. The layout is the Saturday Card Sketch from Two Peas in a Bucket & the postage-themed designer papers are from 7Gypsies Postale Collection." Lauren says, "I've been saving these adorable holiday inchies from Artchix Studios for just the right occasion, and when I saw this week's Unscripted Sketch, I knew immediately this was it. I had planned on just decorating a store-bought envelope to match, but when my card ended up being a non-standard size, I thought I would have a go at making a custom one... and found it easier than I expected! There's a little tutorial on my blog today showing what I did, step by step!" There is still nearly an entire week to get in on the fun-- and have a chance at the prize! Scroll down to the original "POSTAL" post for full details!